» I’m profoundly disappointed in the editorial about helmets in skiing and their newly mandated use on Nova Scotia’s slopes. (“Hard-headed in Nova Scotia,” First Tracks, Spring 2012) Mr. MacMillan and the publisher should issue an immediate retraction and apology for such reckless disregard for the importance of helmets. If Mr. MacMillan is not willing to do that, if he feels his opinion is correct and that as editor his space is an appropriate place to share it, then I think he should be removed from his position because clearly his judgment is poor. As someone who has had several serious head injuries, and many more besides prevented by wearing helmets in a variety of sports, Iain MacMillan’s dismissive attitude toward their efficacy cannot stand. It may be true that a helmet cannot prevent an injury if you’re skiing and hit a tree directly, at speed, but to act as if that’s the only impact a head is likely to take while skiing is dangerously stupid. Further, in the same breath that he dismisses the number of severe head injuries on ski slopes, and wonders how many of them were wearing helmets when they were injured, he states that helmet use is at 77 per cent. Is it possible that the injury rates are so low because the helmet usage rates are so high? It’s clear that there are impacts so great that no helmet can prevent an injury during them, but many impacts are not that severe and modern ski helmets work very well at protecting people during those less severe (and more common) impacts. » Finally, there’s an actual statistic on head injuries and skiing to support all the harrowing anecdotes and stories: 11 serious head injuries in Nova Scotia in 12 ski seasons. Yep, there oughtta be a law! Wait a minute, with 400,000 skier visits, haven’t they just proved Mr. MacMillan’s point that skiing is a lot safer than it looks? A lot safer than most sports? If all the helmet Nazis would stop spitting and spouting anecdotes and look at actual numbers of head injuries (relative to the number of hours or days we spend skiing, or relative to tobogganing!) they might relax just enough to enjoy the sport. Or maybe they could switch religions and work on slowing down speeding skiers, where our sport’s real danger lies. » Great writing! Made me laugh and concur with the wee Mac’s thoughts. Here is a bit of oh yeah: Why do you think that some of us really fast idiots (I’m putting myself in this category only for the idiot part, I think) do not don the lovely tête accoutrement and don’t even think about the “Massive cranium…like an orange on a toothpick.” It is because as thou stated, the foam and a tree/speed ratio is too low. For some other reason, that only a few special neurologists are privy to, putting on the said item puts me in a want-to-go-faster state of mind, with the combo of quieter, vision reduction and loss of wind-in-my-luxurious-hair feeling. You may say bull shyte, laddie, ah, but look around. » I agree with Iain MacMillan that it would be possibly safer to make the slopes safer [in other ways] than spending $1.5 billion on helmets except maybe, as is often, for those skiing above you that mistakenly collide into you. But for the individual Canadian skier, I firmly believe that spending only $200 to protect your head is a MUST DO rather than trying to get the resorts to spend $1.5 billion. So I’d say do as I do: Wear your helmet every day to help protect your very valuable head. A $200 investment is so much easier to do than die. From skiing, I personally have had three severe brain injuries plus mild ones, but I was always wearing a helmet in the downhill speed crashes and, against all odds, I can still walk and talk reasonably well. But now, I never go skiing without wearing a helmet—not for any of the 54 days of skiing last season. But I still think a manufacturer should produce a much safer helmet than for current Canadian government regulations, then sell it at a higher price for the extra safety of those who ski and are at risk. The manufacturer could still sell other helmets for those who want to save a few bucks. » Back in the helmetless days of yore, I did a lot of wild and crazy things on the slopes, but the only time I ever suffered a concussion skiing was while wearing a helmet racing for my high school. Thinking of this, your argument for more skier education when it comes to speed on today’s immaculately groomed pistes makes more sense than trying to enforce something that’s already happening with the vast majority of skiers. » For 10 years I’ve worked as an Emergency Physician in B.C. During this time, I’ve cared for numerous head-injured patients. Recently, while mountain biking, I suffered my own closed head injury, again. Fifteen years earlier, I was run over in a chairlift line by a 10-year-old ski racer. This time there was no broken jaw, extensive dental work or 25 lbs of weight loss due to a liquid diet. Forty-eight hours of cognitive rest in an attempt to alleviate my headache, dizziness and concentration difficulties typical of closed head injuries was effective. Whether mountain biking or standing in a lift line, neither my helmet nor level of skill prevented either of my concussions. Personally, I’ve been touched by a number of head injuries. One was only a few years ago while skiing with my kids at a local mountain. I responded to a number of people yelling for someone to help this snowboarder. I expected to be pulling a snowboarder out of a tree well, but instead I found a young man lying at the tree’s base. It was a graphic presentation and suffice it to say he died in my arms minutes later. Although his knitted tuque was quite fashionable, it did nothing to prevent his untimely demise. The reason for this letter is not to harp on those helmetless athletes. It’s also not to remind them that it’s the law or that skill level is inconsequential. Despite the fact that I often ask patients in the ER if they were planning on falling on their head, I’ve found these to all be ineffective to bring about change. However, financial consequences are often effective. With this in mind, I look toward B.C.’s and eventually all Canadian ski resorts to save lives and decrease the burden of health-care costs associated with head injuries. The solution is to charge an extra $100 per season’s pass for a no-helmet pass or an extra $10/day for a no-helmet lift ticket. If you’re found helmetless in the lift lines and you have purchased a regular helmeted pass, you will be asked to pay the difference for the day. This money will be put toward a free helmet rental program at the ski hill in addition to a portion donated to the B.C. Brain Injury Association. With the cost of rising health care, the sheer number of head injuries and the educational campaigns that have failed, how can we lose? I challenge all ski resorts to adopt this policy and in doing so keep all of us a little safer. 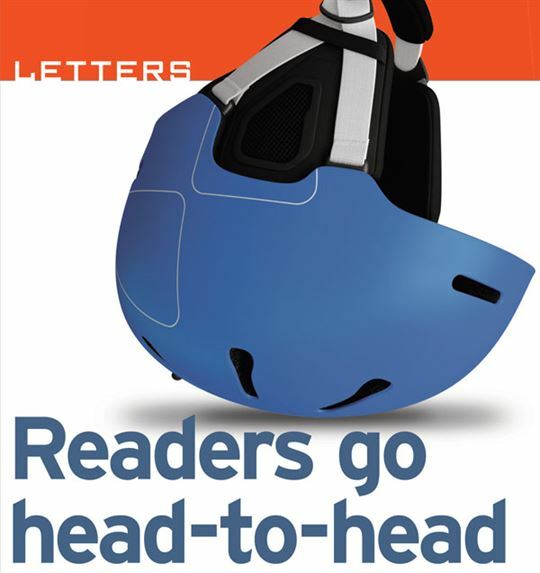 » I enjoyed Iain MacMillan’s accurate observation regarding the wearing of a helmet to protect your head when another chairlift rider insists that, without notice and before advancing three metres, the safety bar must be immediately crashed down! My now third-generation helmet has taken such a blow several times. I began wearing one in 1992 after returning from a year off due to neurosurgery. This in turn was due to my crashing into an immovable, inappropriate piece of “farm fencing” on the hill in a blizzard. After winning the lawsuit, this type of fencing was removed and confined to the farms and orchards where it belongs!